Many dreamers, dream of having their own business some day. But, for most a small business ideas are not a part of their mindset. The business knowledge, the long hours, the hard work — it it becomes apparent that this is not want they want, until after they start. We hear a lot about the successful small business, many get free publicity because of their success. It is the unsuccessful business we don’t usually hear about. The unsuccessful businesses quietly exit their shops, factory or offices — so we don’t get the impression that failure is the norm. These small business ideas will help you determine if you have a business mindset. Whether or not you are successful in business appears to be closely correlated with your type of business. The U.S. Census Business Dynamics database plotted a five-year survival rate of several industries since 2005. The research showed the success of rates of industries from construction to mining with a success rate between 36% to 51%. Then there are those who operate businesses that do not make a substantial profit. They are working long hours and spending most of the money that comes into the business on overhead; rent, supplies, salaries, advertising and marketing. These people did not do their homework to find out the demand and cost of the business. For some of these people demand is low, and the cost is too high; but some just don’t know how to find their interested market. Here are some questions you can ask yourself before you think about starting a business, you will also get several small business ideas. 1. IS IT TIME TO START A BUSINESS YET? If you have worked in every department of a small business as an employee and understand how every single department works, then you may possess this one very important factor for success in your own small business. If you have managed to master the skill of managing money, from small to large amounts, you posses a skill that will help you manage a business. If you have worked in an industry long enough to understand what works in that industry to make profits and what does not, then you have acquired another skill that makes a small businessperson successful. If you understand the team concept, and that you will have more success working with a team of people than alone – this is yet another skill you possess. If you have ever done an analysis of business services or products needed in your area or on the internet, you possess a crucial ingredient for business success. Many businesses start up and fail because the market has been saturated with the product or service they sell or they don’t understand how to bring this market into their business. Get 3 Amazing Gifts When You Join, MsFinancialSavvy! 2. DO YOU PLAN TO BUY A BUSINESS OR START ONE OF YOUR OWN? Both starting your own business and buying a business carry risk. In starting your own small business you need to have the qualities above and understand small business in general. The main issue is that it takes awhile to build a small business. You have to find customers and build the customer base. The hours are long and concentrated. There are no pending lawsuits against the business. When you buy a business, you need to spend money on a forensic accountant to determine if the business has produced what they are claiming. It is wise to spend money on an investigator and attorney to find out if the business is clear of any wrongdoing. If you don’t have the funds for this, or don’t feel it is necessary, you could end up with a worthless business, it has happened to many before you. 3. DO I UNDERSTAND THE COST OF THE BUSINESS? One of the most difficult concepts for beginners in business to understand is cost. Some businesses have cost of 90% of business income and some have cost of 50% of business income. No matter what your business, you will have overhead cost. Businesses go bankrupt all of the time. One major reason is that the cost becomes more than the business income. The following cost are important to understand before you buy or start a business. The rent or lease cost and terms of both. The cost of equipment for the business. The cost of supplies used and ordered for the business. The cost of producing the product or service, (materials, time, labor). 4. HAS THE NEED FOR THE SERVICE OR PRODUCT BEEN ESTABLISHED? Has the market been consumed with businesses of the same type as yours? If you are starting a new business, have you tested the need for your product by starting to sell it and building customers at a flea market, out of your home, or small office. If you increase your sells over time and get repeat customers and a growing customer base, this is one sign the product is in demand. Have you tested different price points with your business product to see what sells the most, and you still get a profit of at least 20%. This is low, but at least it is a profit. Purchasing a business works best when you have worked in that business, You have the opportunity to see the need, you see the profitability, and you understand the product. 5. HOW DO I REACH MY CUSTOMERS? effective than advertising because if done right it is more believable. Studying advertising and marketing effectiveness is crucial. You can spend if you are not educated about both. THE CUSTOMER IS KING, has been, and will always be the most important phrase you will ever hear. If customers don’t get the product or service they are paying for, they will leave. If your business has little or no customers, it is a hobby. In some cases it is a very expensive hobby. are worth their weight in gold. They are a part of the team that will help you to achieve success. Do your research, seek out advice from successful people, put in the hours, and listen when you get advice. Before you start a business you MUST understand budgets. 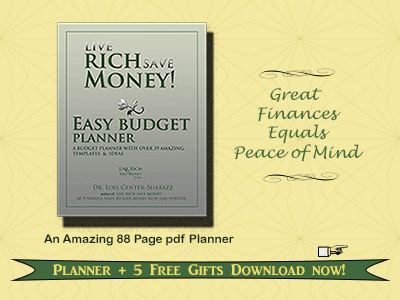 Use the “Easy Budget Planner” to get started.